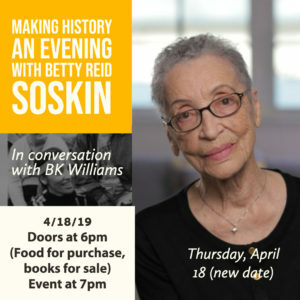 Join us for an evening with a national icon and local favorite Betty Reid Soskin, in conversation with Brenda Williams. The evening will begin at 6:00 pm. Betty’s autobiography “Sign My Name To Freedom” will be available for purchase. A southern menu of Deep-fried Turkey sliders, Collard Greens, and Red Beans and Rice will be available purchase by Phillip Mitchell of R&R Coffee. Join us at 7:00 pm for the presentation followed by a Q&A. Betty Reid Soskin is best known as the oldest ranger in the National Park Service at Richmond’s Rosie the Riveter/World War II Home Front National Historical Park, as the woman who became the face of federal government workers during the 2013 government shutdown, as a national icon and an international treasure who has been honored by universities, institutions, and civic organizations around the world as one of the leading folk historians of our time.